Project Perfect Mod :: View topic - question&suggestion about Prerequisites. Posted: Mon Apr 23, 2018 6:19 am Post subject: question&suggestion about Prerequisites. How can I make PrerequisiteOverride required more than one building to override? It seems when the player has any of building in the list then the player will be allowed to train that unit. what I want is the player need to have all buildings in the list for the override. if ARES has something like PrerequisiteOverride.list# which do this would be useful. I think this tag shouldn't really be set for the player to get permanently access by default. Use Prerequisite.Lists= to replicate PrerequisiteOverride. FactoryOwners.HaveAllPlans= is already set to no by default. How is that gonna works if I am a country in ForbiddenHouses list. I was meaning about permanently accessing all factory plans. all factory plans should be gone when the building doesn't exist anymore. What exactly are you trying to do with PrerequisiteOverride? If you dont want the player to permanently access the plans then just dont use the tag. skip the ForbiddenHouses which also required properly arsenal factory. is using when you want that building to give you all "factory" plans. this means if you set this tag to barrack then when you captured it. it'll also give you warfactory plan of that country you captured. you can't get warfactory plan with FactoryOwners.HaveAllPlans=no on the barrack. the best way to use this tag is set on MCV if it's not getting ruined by permanently accessing. isn't that just one building required to overrides as well. Let's see, this could be confused explaining. I want UNIT1 to be Forbidden from Soviet1 but trainable by Soviet2+ and other factions. this done by regular Prerequisite. but Soviet1 has to have SovietWF+Radar+Soviet2+'s Lab in order to train this UNIT1. as you know this can't be done by PrerequisiteOverride=Soviet2Lab,Soviet3Lab because it overrides SovietWF+Radar for other factions that required it meaning that Allied could train this UNIT 1 with AlliedWF+Soviet2+'s Lab I do not want this happens. If you want country special units buildable if you capture that countries base, the best method would be to re-code all the countries into individual sides. Doing so would also give you a lot more options for customizing each country too. It would require a lot of work to do so tho, especially copy & pasting all the AI code for each of the new "sides". If you want country special units buildable if you capture that countries base, the best method would be to re-code all the countries into individual sides. Isn't that what FactoryOwners is for? For some weird prerequisite stuff like that though it might be better just to clone the unit for Soviet1, though how you make it so it needs a Lab built by Soviet2 I don't know. Might not be possible, unless it was its own unique building. imagine you're USA and then captured British's Conyard, now you'll getting access to the Snipers. if the British's Conyard you captured is destroyed or repacked, the Snipers still be trainable. nobody wants this isn't it. The snipers should be gone when you don't own British's Conyard anymore. this should be the default way for FactoryOwners.HaveAllPlans=yes. I don't want Soviet1 to get UNIT1 by captured Soviet2+'sWF or by captured Soviet2+'sConyard with FactoryOwners.HaveAllPlans=yes. the only way Soviet1 can get UNIT1 is to capture Soviet2+'sLab. so the FactoryOwners can't make this done. If you captured Soviet1,2,3's Conyard then you'll getting access to build Soviet1,2,3'sWF which that is really funny way to go. I thought about clone unit section as well but I don't think that is a really good way to go. because It has a chance to have clone and real one in the same match. when using Reverse Engineer logic. you'll get both of them on training tab that is really weird. It would be more weird if set CanBeReversed=no on one of them. so I think if this the PrerequisiteOverride.list# I made up which I think is the best way does exist. It would completely solve this system. so I made this topic. Ares supports more than one prerequisite list. Each prerequisite list acts as an independent copy of the existing Prerequisite flag, and a minimum of one of the prerequisite lists must be satisfied for this type to become buildable. For example, if you set Prerequisite=GAPILE,GATECH and Prerequisite.List1=NAHAND,NATECH then the object will be available to any player who owns both an Allied Barracks and Battle Lab, or a Soviet Barracks and Battle Lab. Either Prerequisite or Prerequisite.List0 has to be specified, because these are only additional lists and the original prerequisites list is still used. If this is ignored and the list is left empty, the object will become always buildable, because an empty list is always satisfied. Specifies how many extra Prerequisite lists complimentary to the one default list are available. Defaults to 0. The BuildingTypes required to satisfy this prerequisite list. Each list is checked on its own, and if any list is satisfied, the Prerequisite requirement is satisfied. Prerequisite.List0, if specified, overrides the existing Prerequisite flag. time to test. and will let you know the result. Well, I definitely wanted it. And I coded the feature. The whole point of HaveAllPlans is that it gives you permanent access, because you cannot transfer the "plans" from the building on your own (unpacking/repacking will transfer a building to your country + if you capture a Soviet conyard as Allies, all your Soviet buildings built with it will be considered as factoryowned by your Allied country), something I considered more of an issue than the lingering plans. And no, it took me months to try to come up with a middle-ground without success. Also pretty sure PrereqOverride.List doesn't exist. You're right, I don't know where I ended up combining the 2, but I did, even though I quoted the documentation. But change PrerequisiteOverride.List(#)(s) to Prerequisite.List(#)(s)= and it'll be the same thing. Either way, it'll require a different building for Soviet1 than 2 and 3.
oh , I actually need HaveAllPlans because it give me the access to units on barrack, warfactory, shipyard, airbase of that country not because permanently access. I'm not really understand what are you meaning by that parenthesis. or this is not doable at all is that what you meaning? But change PrerequisiteOverride.List(#)(s) to Prerequisite.List(#)(s)= and it'll be the same thing. Either way, it'll require a different building for Soviet1 than 2 and 3.
it's obvious that list1,2 is not necessary. sorry if I misunderstanding you. ForbiddenHouses and FactoryOwners isn't required for this method. why that method has 3 WF? is it just clone of Prerequisite.List# which using PrerequisiteOverride function instead? I will use MO units as a explaination for this because it's famous and you can image them easier. these upper two cases is already works exept the last part (PrerequisiteOverride.Lists). in a match, Yuri somehow managed to captured Soviet Conyard and build SovietWF of their own. This SovietWF's Owner is Yuri right. Let's see the case I want to happen. you can get Halftrack later by captured the SovietWF from another real Soviet Side than RU which is owned by LC or CN. I made a pic how is this works. if there's one of tags is "empty/not set", that tag will return no. this meaning that it will leaves the another one(which is set) adjudge the result. so which do you think is better. current way or mine. I don't think current way can made this double stealing case happens. If looks in opposite way everything that the current way can do my way also can do as well. this is the same way how FactoryOwners.HaveAllPlans=no works but with getting All Plans instead of just Structure plan. this is why I first suggested FactoryOwners.HaveAllPlans=yes to be Impermanent by default, for avoid confusing. so you can make something like FactoryOwners.HaveAllPlans.Permenant=yes if Impermanent is default. if a country has been set in both tag. THAT country in "FactoryOwners=" list will be considered as Forbidden WHEN you have Factories built by that country AND any of other forbidden countries. I make this addition because I found out that my old FactoryOwners system broke the forbidden point. Point that out for me please. maybe you see something that I don't. - if you don't have any of factory built by country(s) in BothTag list. check the FactoryOwners= tag, The result will be FAIL if you don't own any of its list. - You do have any of factory built by country(s) in BothTag list then remove BothTag country(s) from Factory.Forbidden list and then check the Factory.Forbidden tag If you own any factory of Factory.Forbidden country the result will be FAIL. - if FactoryOwners and FactoryOwners.Forbidden aren't set at all. result will be PASS of course. - if there's one of tags is "empty/not set", that tag will return no. this meaning that it will leaves the another one(which is set) adjudge the result alone. EDIT: Hmm even with this. It still has some case that couldn't do. This would result in CN not being able to build it at all so there's no point in listing it as FactoryOwners. Even though it's in FactoryOwners and not FactoryOwners.Forbidden, it's still in ForbiddenHouses and can't be built, again no point in listing it in FactoryOwners. No because CN is listed under Forbidden. If not listed under Forbidden then it works, yes. 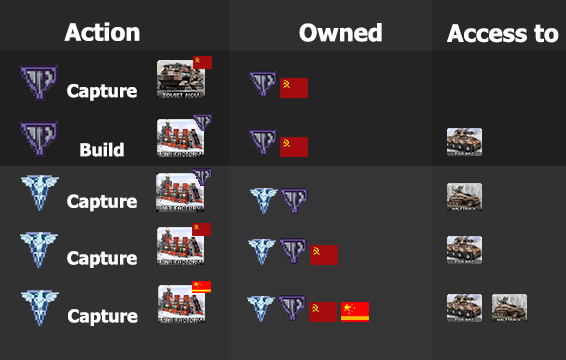 CN can't get FUTURE CHINA TANK because its not listed under FactoryOwners and Foehn1 can't because it's listed under ForbiddenHouses. Again, CN and oldCN are not listed under FactoryOwners and Foehn2 is listed under ForbiddenHouses, so none of those houses can own it. If a "Player has any factory built by a FactoryOwners country" but also has a factory build by a FactoryOwners.Forbidden country then it would still be unbuildable. If a "Player has any factory built by a FactoryOwners country" but isn't listed under that unit's FactoryOwners then it's unbuildable. country(s) owner that can build this TechnoType but don't give you this TechnoType when other country got this country(s). I read the pic, I read it at least 5 times over, it would do exactly as I stated it would and the 3rd option would fail. In the above method, CN would be able to build it, but even if you captured CN's factory and stole their tech, oldCN,Foehn1,Foehn2 wouldn't be able to build it. ForbiddenHouses only forbidden your initial House not factory owned. what if I want oldCN be able to build it when captured CN's factory? if I want oldCN to be able to build it without captured CN's factory? & without giving this unit to Allied when Allied captured oldCN's factory. Allied can get this unit by captured CN's factory. -oldCN will not lose this unit when captured Allied. maybe scratch all my suggestion and move the Allied to a new FactoryOwners.callBySomething Tag. Hmm I just blew my own mind. My mind stuck now, couldn't go that far. owning any factory built by country that set in both FactoryOwners and FactoryOwners.Privilege, the Result always be PASS. owning any of these, the Result will be unbuildable. - if set a same country in FactoryOwners.Privilege and FactoryOwners.Forbidden. the Player who has that country's Factory( this case) still have chance to PASS if has any of factory built by FactoryOwners country. Hmm, yeah this would work now. :D if not set FactoryOwners.Privilege at all, it's just the same way how ARES work.